It’s been a few months since I last updated the members on all the activities that are taking place within the Class. There are many positive developments which bode well for the Class going forward. Clagett Boats: The Clagett Foundation has purchased three new 2.4mRs and offered them to sailors with disabilities to use for up to four years. Wendy Frazier of Calgary has received one boat which will be kept in Victoria. A second boat has been given to Siobhan MacDonald of Mabou NS. The Ottawa Clagett boat has been reassigned to Brian Peckover, the 2018 Mobility Cup winner, while Delani Hulme-Lawrence will be keeping her boat in Victoria again 2018.
boats. New sailors from Marblehead and Milwaukee supported the event as well returnees from Guatemala, Norway, Canada and the USA. The Toronto Fleet will be running the initial CAN-AM North series out of National Yacht Club this summer. Victoria and Seattle are in discussions to have a CAN-AM Pacific Coast series of regattas starting 2020. Sail Numbers: The Canadian Class is the issuing authority for 2.4mR sail numbers in Canada. These are issued without cost to members of the Canadian Class Association. Issued numbers are posted on the Class website. From time to time, requests are received from new boat owners wishing to have a number which has already been issued. In some cases, these numbers were issued to boat owners who are no longer members of the class. Starting in September 2019, if a member has not paid their class dues in either 2017, 2018 or 2019 these numbers will be indicated on the website as “inactive” and may be available to anyone joining the class and wishing the number. The incumbent sail number holder will have 30 days to join the class and keep his/her sail number. If they fail to do, so the new member will be assigned the number. Jib Boom Boats: For a number of years, many of us in the fleet have watched Bjørnar Erikstad sail his jib boom boat to consistent top ten finishes in World Open 2.4mR and World Para Championships. This winter, Bruce Millar and Tony Pocklington spent time developing a jib boom boat with the goal of making the boat easier to sail for people with disabilities. Although not yet perfected, Bruce sailed the boat in the final Winter CAN-AM regatta, placing 4th. More work will be done on the boat this summer and already there is quite a lot of interest from other sailors to order new boats with recessed decks to accept the curved jib boom track. 2020 2.4mR World Championship: The 2.4mR World Championships are coming to North America. The proposed venue is Davis Island YC, Tampa Florida. The proposed dates are November 7 – 14, 2020. Details are developing and once the proposal has been approved by the International Class, we will be able to provide more information. Looking forward to seeing everyone at regattas this summer. Notices of Race and Results are linked above, where available. Genova itself is a very old city and the beautiful Ligurian countryside gives great opportunities for exploration during the event for sailors and supporters. The marina and yacht club are central to the city. Our ‘Worlds Village’ is a short way from the yacht club premises and is housed inside the huge exhibition centre that is alongside the marina where our boats will be berthed. Berthing will be against fingers coming off the floating dock that is anchored to the marina side so is very stable. Along this huge length there is capacity for over 100 2.4s with any disabled sailor being moored side on to the stable floating dock and there will be personal hoist possibilities for any sailor requiring it. Every part of the ‘Village’ is fully accessible with smooth concrete over the outside area and lifts within the building for access to separate rooms for secretariat, jury, race officials plus a room with chairs and tables for our AGM on the Sunday. The club is very aware of our measurement needs and will be allocating eleven people to perform this from the Saturday to Monday. This measurement process will be very efficiently performed and will allow quick and hassle free launching of the boats within the measurement timeframe. There are huge concrete areas for parking of vehicles and trailers which will be open from the 11th October, Friday but before that may coincide with the Genova Boat Show breakdown so arrival before that date will not be possible. Part of this area and very close to the main Village building has a high canopy under which motorhomes can be stationed and the cost of this will only be to cover electricity and water provision payable onsite. Within the ‘Village’ will be toilets and shower facilities. The club have rescue ribs allocated as one rib per ten boats and this will be done in conjunction with the waterborne Red Cross. There is provision with the coastguard to signal a disaster scenario at any point with possible helicopter evacuation. The yacht club have a very long and renowned history of staging international events and the Olympic qualification event in April there is a good example of this. Luigi Monaco who is running the technical side, NOR, SIs etc, is also acting as race officer. He has forty years experience of race organising so we can be sure of good racing. There will be food availability in the ‘Village’ during the whole event and there will be pasta offered within the entry fee at the end of sailing each day together with prizes for the winners of each days racing. The Friday dinner and prizegiving will take place in the beautiful yacht club with 140 years of history attaching. .There will be an opening ceremony including the hoisting of country flags and we will be asking NCAs to provide their country flag. There is about a half hour sail to the racing area which is outside any commercial shipping areas and accords the possibility to be viewed from the main promenade as a spectacle for the city. There is also a possibility that a boat will be provided to take spectators on the water. We have ten races planned plus the practice race from the Monday through to the Friday and we can be sure of a worthy world champion once again. All in all it seems to me that we will have a fantastic event and we will continue to liaise with the club over the coming months to assure success. Any comments please come back to me. This is a World Championship not to miss. My wife and I are making travel plans for Genoa this October. If there is any interest from the rest of NA I could ship my container over to the venue for the event. Or, I have soon to be shipped boats on order with Charger at the moment, I could leave one in behind for me to use. Thought I would send out a note to see if there is any interest. We plan to arrive in Genoa on the 8th, but could be there on the 7th to help unpack/etc if nec. Yes there is plenty of charter boats available in Finland. The price for the charter is 2500€ including transportation to the venue. You can put mine contact information to the website post you are making if anyone has further questions. I would appreciate if we could get all the interested people contact me before the end of March 2019. After we get all the interested people we can start planning the logistics to Italy. ‘Wanna come and freeze your assets off?’ I said, in an email to our sturdy 2.4mR group, in mid January, when Victoria was bathed in spring-like temperatures. ‘Sign up! It’ll be fun.’ Then a few days before the regatta Victoria received its biggest dump of snow in 40 odd years and John and myself were trapped in the house, let alone capable of getting to any regatta… Fortunately the melt came quickly, the temperature-rise less so, so getting kitted out required the full 2.4mR regalia of multiple layers, wrist-seals, neck-seals, toques, spare-toques and of course (‘every time you go to sea,’ as Louise Anstey astutely noted) sunglasses. With seven entries our fleet was second in size only to the Radials, and joined by Chris Maier from CFSA, his first time racing the boat. On Saturday the wind looked classic Victoria ‘light and fluky’ but actually settled down to a decent SW-ish and we had six excellent races with Louise giving me and Doug Bell some lessons in what we should and (mostly) shouldn’t be doing. With all classes racing on the same course everyone had to be hyper-aware – a 49er needs a lot of room from our slim wee 2.4s at the leeward mark… Louise won the day with excellent tight racing. On Sunday it was cold and clear with a brisk northerly, waves, strong current and COLD. Oak Bay was a fine sight with the snowy mountains circling us, skiffs flying around (and some swimming…) and even tighter racing in the 2.4mR fleet, with overlapped finishes and a stellar bullet for Delani Hulme-Lawrence. Louise won the event with Jackie second and Doug third, but the real winner was our fleet which can only improve with such tight, competitive racing and new participants. Thanks to the Race Committee for sterling work managing all the fleets; the coaches for encouragement, food and dry clothing; and all the sailors who made this event a real spectacle and a whole lot of fun. 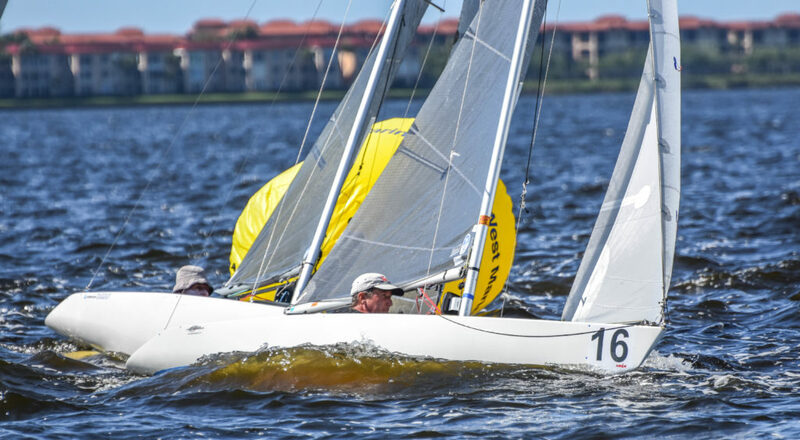 Port Charlotte, Fla. (November 8, 2018) – The U.S. 2.4 Meter Class Association has announced its return to South Florida’s West Coast for the third edition of the class’ CanAm Championship Series which will feature five regattas hosted from the Charlotte Harbor Yacht Club (CHYC) in Port Charlotte, Florida. 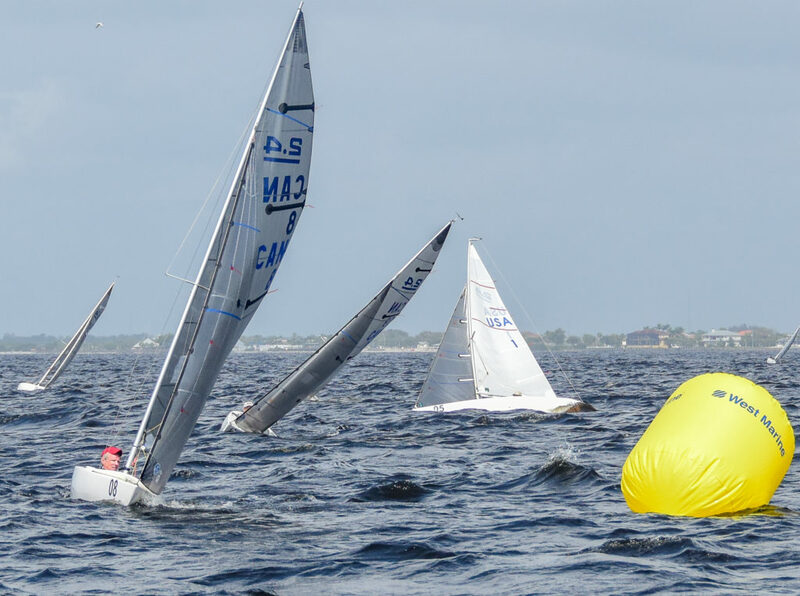 Well-known as an ideal area in which to escape the winter, Charlotte Harbor has become a favored destination of the 2.4mR class due to the reliable breeze and to the protected waters of the Peace River where races are held. The 2019 CanAm Championship Series kicks off next month with the six-race 2.4mR North American Championship from December 3-5, 2018, followed later that week by the nine-race 2.4mR U.S. National Championship, December 6-9. 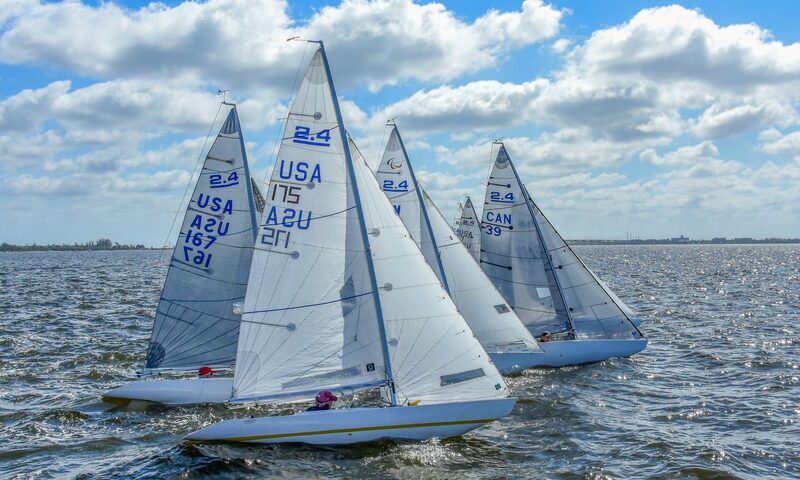 After a break for the holidays, competition resumes in the New Year with the 2019 Edge Sailing Midwinters scheduled for January 25-27, and CanAm #4 from February 22-24, each of which is scheduled to have five races. 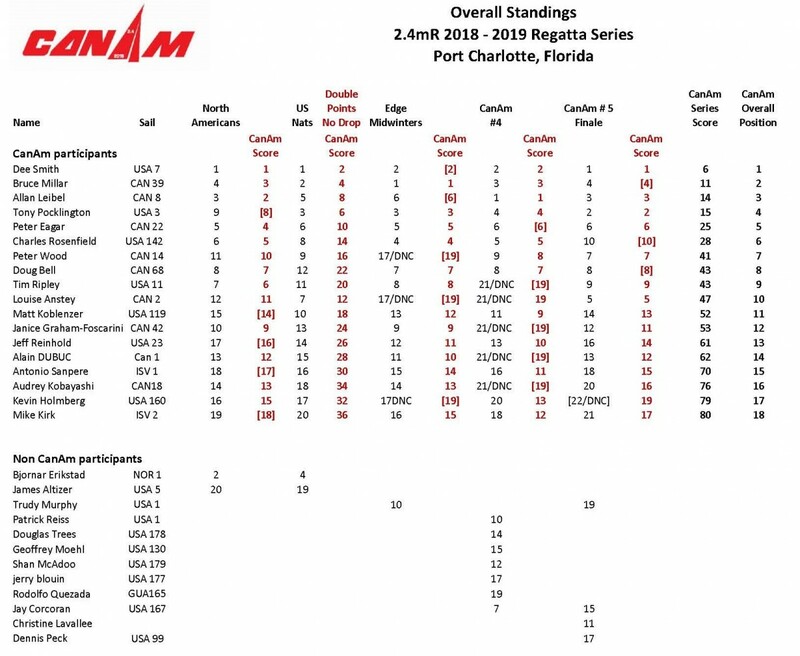 The series concludes with the nine-race 2019 CanAm Championship Finale from March 29-31, with the series champion determined from the results of all five regattas after his or her worst score is discarded. For competitors who do not race in all five events, the scoring will count all events sailed (i.e. they will not drop their worst result). Sailors from as far away as Norway, San Diego and Seattle, along with a strong contingent of Canadian snow birds, were among the almost two dozen entries in the 2018 championship series. For many, the opportunity to race regularly and have a break from the winter weather is an irresistible combination. Competitors who register for the entire series by November 30, 2018, will have their boat storage from December through March included as a perk. Details of the regatta schedules, social events, hotels and more may be found in the just published Notice of Race, available here.